Australian teachers and education leaders if you are looking for new and exciting ways to integrate the 'Intercultural understanding' objectives of the Australian National Curriculum into your learning environment, the Flat Connections Conference is the place you should be. (June 18-20, 2014. Sydney). It is with much anticipation that I am exploring the Australian National Curriculum (ANC) documents and becoming absorbed in the 'Intercultural Understanding' sections. As an IB (International Baccalaureate) teacher for 10 years, and a global educator, having taught across six different countries, I may have had more access to conversations and documents to do with intercultural understanding, cultural awareness, third culture kids, international mindedness, and cultural awareness than perhaps the average Australian teacher to date. It is certainly heartening to see a focus and emphasis on exploring how to recognise different cultures and develop respect now embedded into the relatively new national curriculum guidelines. The website provides further details including the following three areas. Some key statements and examples are selectively shared here to show clear alignment and empathy with the aims and objectives of Flat Connections. 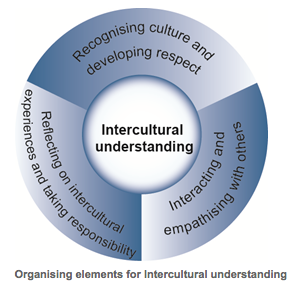 Read the full Intercultural Understanding Learning Continuum as provided in the Australian National Curriculum. The Flat Connections Conference, (and Flat Connections global projects) is a unique opportunity for teachers, students and education leaders to become immersed in a process whereby participants are teamed with others they have not met or worked with before, including different nationalities and cultures. It is a chance to break through stereotypical attitudes and prejudices and learn how to create something meaningful with others who are similar but not the same, and who may have different backgrounds and perspectives. "The capability involves students in learning about and engaging with diverse cultures in ways that recognise commonalities and differences, create connections with others and cultivate mutual respect." "Intercultural understanding is an essential part of living with others in the diverse world of the twenty first century. It assists young people to become responsible local and global citizens, equipped through their education for living and working together in an interconnected world." The Flat Connections Conference, to be held in Sydney, June 18-20 provides an opportunity for teachers to learn more about how to embed 'Intercultural understanding' into their curriculum at all age levels through new pedagogy and curriculum design that focuses on global collaboration supported by emerging technologies. In the words of Anne Mirtschin, award winning Australian government school teacher who will be a lead facilitator at the conference, 'The world is my classroom, and my classroom is the world'. That is how 'flat' and 'connected' learning takes place. Technology makes connections and collaborations, and potentially intercultural understanding possible however for many teachers and students it is not clear HOW to harness the new tools and HOW to effectively harness 21st century learning objectives so that new conversations and meaning can be created. The Flat Connections Conference provides a pathway, the beginning of a journey into better understanding of this and aligns very nicely with the ANU Intercultural Understanding requirements. How does it do this? Let's take a closer look. "What are the stories we want to tell to break through stereotypes and emphasise common humanity?" Discovering new stories, in conjunction with the design process of the conference, the aim is to open eyes to a more enlightened future of interaction and collaboration across the globe. The Flat Connections Conference Program provides time for interaction, consolidation, ideation, and skill development with multimedia and Web 2.0 tools for both students and teachers. The conference is about ideas - merging and melding cultures to create the best new projects and curriculum designs to join the world. It is about empathy with others, learning how to work with others, learning how to create a final product/proposal from set of initial ideas, learning how to flatten and connect using technology......and much more!